Roger Federer won the Australian Open over the weekend, his 16th Grand Slam event, putting him now two ahead of Pete Sampras for the most career major titles by a mens tennis player. What may be even more impressive than Federer’s number of victories is his streak of reaching at least the semifinals or better in majors…22. That adds up to be over 5 years where no one could beat him until the final 4 of the tournament. That kind of consistency is unheard of…even great players like Sampras and Borg never achieved anything close to that. The old heads will tell you that Rod Laver was better than Fed, but there is no denying his greatness. I feel so fortunate that I have been able to watch his career unfold. Some may tell you it’s his world class forehand that makes him so good, or maybe his ability to ever-so effortlessly glide around the court, but I think there is no doubt that his success is in large part thanks to what sits between his ears. Federer has been mentally stronger than any other player in tennis the last half dozen or so years. There is just no other way to explain his success. 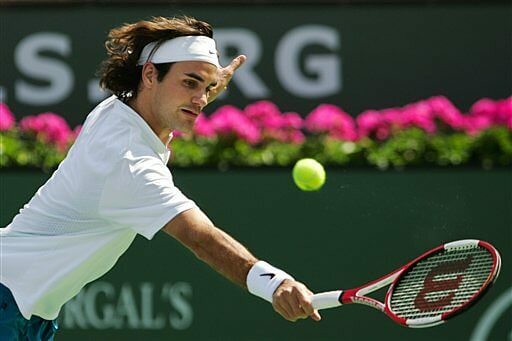 Earlier in his career, Fed may have been more physically gifted than some of his peers, but that is no longer the case. Federer is getting older while his opponents are getting younger. They can hit harder, run faster, and play longer than him…in terms of raw ability, they can do pretty much everything better than him on the court. However, these players lack one aspect to their game that Federer dominates…and that is the mental aspect of tennis. His ability to focus on the court has allowed him to overcome anything his opponents may have on him physically. Anyone that has played tennis knows how difficult it is to maintain your composure on the court…you can hit 10 great shots in a row, miss an easy one, and totally lose focus because of that one bad miss-hit. You need to have the ability to treat each point almost as a new match…you can’t worry about what happened 30 seconds ago. You will seldom see Federer get rattled…I could probably count the number of times I’ve seen him get flustered over the years on only one hand. Nothing seems to bother him when he’s on the court, yet other players will noticeable become frustrated or lose focus in the key moments of a match. Federer also has the ability to rise to the occasion during big points, whereas other good players are not able to (at least as consistently). I can’t even imagine what it’s like playing in front of a packed stadium like they do, but I am sure every action within the match is magnified when thousands of people are oooing and ahhing. It must be tough! How has Federer raised himself to this level of mental prowess? I wish I could answer that myself. His opponents are the best in the world, and I am sure are nearly as mentally tough as him, but for whatever reason, they have not quite matched his ability. I do know that he puts a lot of work in off the court, conditioning himself for long matches (even though he often wins in straight sets). I suppose that he comes into every match knowing that he is in the best shape he could possibly be in, but I am sure nearly all of his opponents could say they are just as prepared. It would be interesting to know what Federer is thinking while he plays and how he fortifies his mental game…maybe he’ll write a book and explain how he does it. Until then, all we can know for certain is that he is a prime case and point for mind over matter.